WASHINGTON (Reuters) - The chairman of the Federal Communications Commission on Friday pressed major U.S. phone companies to take immediate steps to make technology that blocks unwanted automated calls available to consumers at no charge. 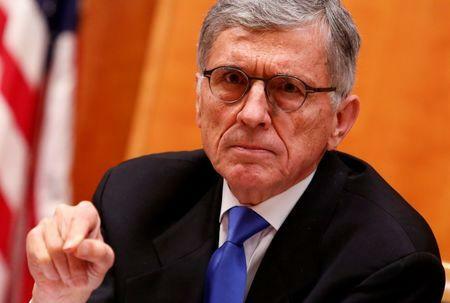 FCC Chairman Tom Wheeler, in letters to CEOs of major phone companies, said so-called robocalls, automated pre-recorded telephone calls often from telemarketers or scam artists, continue "due in large part to industry inaction." Wheeler's letters went to chief executives of companies including Verizon Communications Inc, AT&T Inc, Sprint Corp, US Cellular Corp, Level 3 Communications Inc, Frontier Communications Corp, Bandwidth.com Inc, and T-Mobile US. Wheeler said in a blog post on Friday that he wants answers from the companies "within 30 days with their concrete, actionable solutions to address these issues." The letters, reviewed by Reuters, noted that the FCC does not require phone providers to offer robocall blocking and filtering but the FCC has "strongly encouraged providers to offer these services" at no charge to consumers. Tom Power, general counsel at CTIA, the wireless trade association, said on Friday that "unwanted calls and texts are a consumer issue the wireless industry works hard to address and we look forward to working with the FCC to help address this challenge together." The FCC gets hundreds of thousands of complaints annually about robocalls and unwanted text messages. Wheeler's letters also said providers can do more to ensure that incoming calls are not "spoofed," when callers falsify the information transmitted to caller-ID displays to disguise their identity. Scam artists often try to appear to call from a bank or a government phone to trick consumers into disclosing confidential financial or account information. Other scams pitch phony vacation or mortgage offers. In the letters, the FCC said the phone industry should create a "Do Not Originate" list that would allow government agencies, banks and healthcare providers, among others, to register their phone numbers and would allow providers to block calls from outside the United States. Many phone scams based overseas target Americans. The FCC said last year it agreed that phone companies should not block calls without customers permission. Wheeler noted that providers "have suggested that blocking should wait until new Caller ID authentication standards are in place, but that is not a valid excuse for delay." The FCC has brought 13 enforcement actions to combat robocalls since 2013. In 2015, the FCC fined a Florida company nearly $3 million for illegal calls promoting travel deals.